Stunning pair of Charles David peep toe stilettos. Main color is beige and black, with silver and a touch of red. This pair has only be worn once and are in excellent condition except for 2 small marks on the inside of the left shoe, thus is not so visible when you are wearing it. Wos Stilettos. Black Patent Leather Textured. Charles David. Gold Heel Peep. 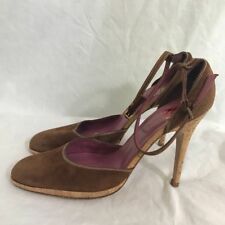 Brown Suede Ankle Strap Heels. Cork slim heel. Label Charles David Collection. Beautiful cut out detail on the side of foot. Very high heel 5” but with 1 1/4” platform resulting in 3 3/4” effective heel elevation. Strappy suede upper. Ankle strap with adjustable buckle closure. Color: Dark Brown. Buckle details along vamp. Open round toe. 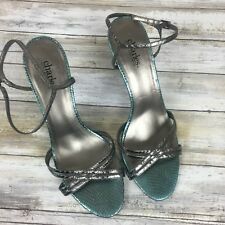 Charles David Fox Metallic Champagne Patent Leather Peep Toe Stiletto SZ 10 Condition is Pre-owned. Shipped with USPS Priority Mail Medium Flat Rate Box. Charles by Charles David. Ruched front heels. Colorful red, green & yellow splashy/camo pattern. Charles David brown textured high heels shoes with frontal wedge and bow accent size (7B). Shoes have minor indentations on the inside part of the shoes, but are in excellent condition overall! Charles David platform heels. Worn once. 5 inch heel; 1 inch platform in front. No box. These run a little big in the heel. Inside heel has mark left from heel insert. Can likely be rubbed or wiped off. Sold as is. Please see picture. These shoes are hot! Light wear. Smoke and pet free home. Fast shipping.